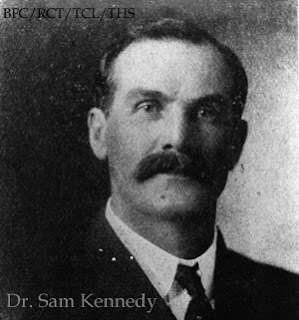 Dr. Sam Kennedy came to Tulsa with his brother Jim in 1891 to establish medical practices in the little village of Tulsey. The town at that time had a population of about 350 with two general stores, a modest hardware store, a drug store, livery stable, blacksmith, saddle shop and one hotel- the Owens Hotel. They made their homestead on 4th and Boston and some two years after their arrival they erected a five room house on it. 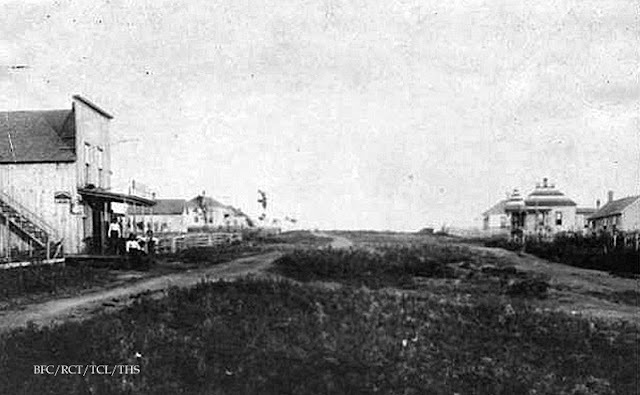 The photo below is looking south on Boston towards 2nd Street ca 1894. Dr. Kennedy's house was on the left side. Around 1895 they built the first brick building for their office on Main Street between 1st and 2nd. The brick used was sun dried and made by primitive methods. The doctors practice extended for many miles over the thinly populated country which meant traveling many miles by horseback or buggy to attend the sick. Patients were visited as far away as Cleveland, west to Kellyville, south to Mounds and Bixby and to Catoosa, Skiatook, Keystone and Mannford. Both brothers served as Osage County Justice's of the Peace so that local residents across the county line would not have to travel to Pawhuska to do basic legal business. Both doctors married sisters who were part Osage Indian. Sam and his wife had seven children. 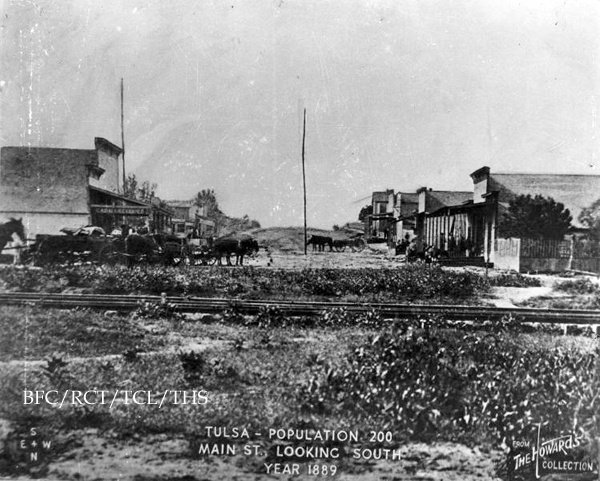 In 1906 when the Osage lands were distributed Sam used his wife and children's tribal allotments to acquire hundreds of acres in Osage county, land that is northwest of downtown Tulsa. Part of that land was used as an active ranch where he raised a large herd of shorthorn cattle. The rest of the land was rented out. The Tulsa Country Club acquired it's land from Dr. Kennedy. The founders of Tulsa all had great faith in the future of this city. 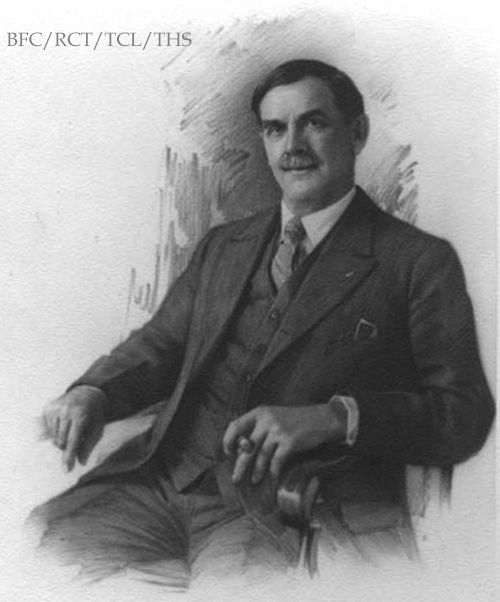 Aside from being a country doctor, Sam Kennedy was a charter member and the first director of the Commercial Club, predecessor to the Chamber of Commerce. He served on the city council and was on the committee that helped to secure the Katy and other railroads as well as a member of the first water board which directed the Spavinaw project. His signature was one of those on the original charter for the city of Tulsa. Dr. Kennedy retired from medicine in 1907 and focused his interest on other interests. He had the foresight to purchase even more of the Osage land as it was put up for sale by the Indian Agency and soon he owned approximately 10 square miles. He partnered with W.A. 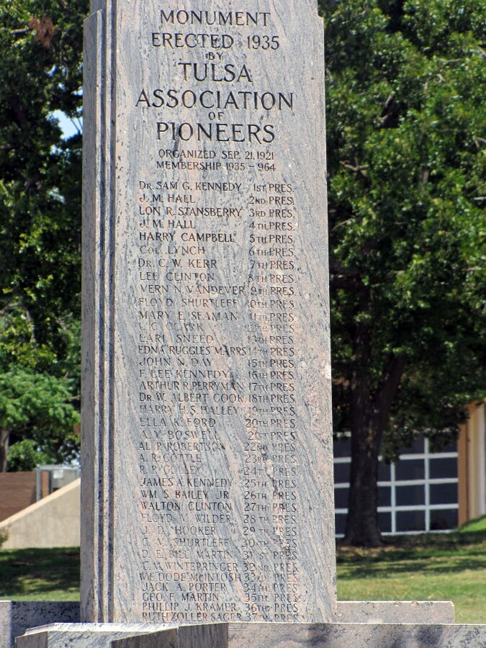 Springer and together they acquired an Osage lease on which 140 wells were drilled between 1913 and 1917. They sold their half of the interest in the lease for $6 million dollars. Dr. Kennedy sold his 4th and Boston property to a developer named S. Gallais who immediately began construction of his namesake building. 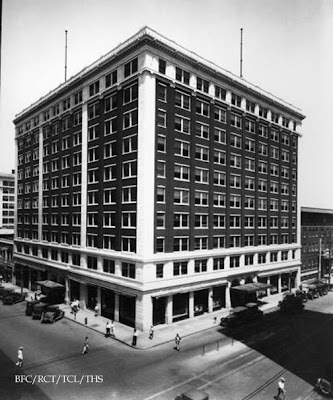 In 1919 Kennedy bought the Gallais building and proceeded to triple its size, proclaiming it to be the largest building in the southwest at the time. 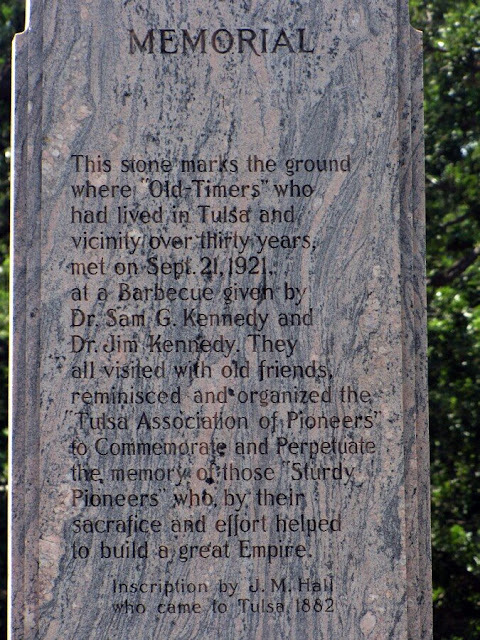 In 1921 he invited all of the "old timers" out to his ranch for a huge barbecue. More than 300 were present and it was during this barbecue that the Pioneers Association was formed and he was elected it's first president. This monument was originally erected on Dr. Kennedy's property and now stands in Owen Park today. 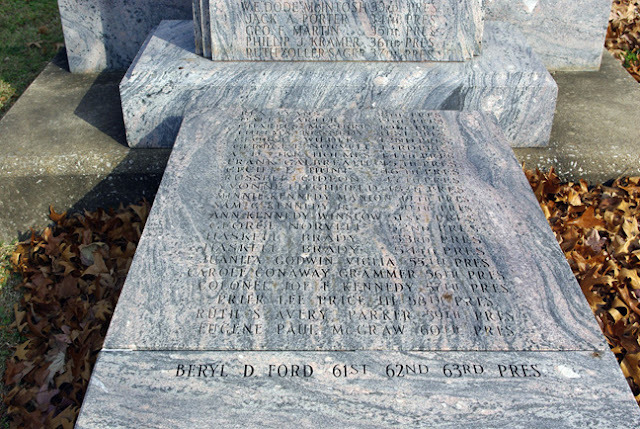 Scores of Tulsa's first families names are inscribed as well as past presidents. The house known today as the Kennedy Mansion was built in the early 1920's. There was one thing that Dr. Kennedy did that had very long-range consequences, whether intentional or not. 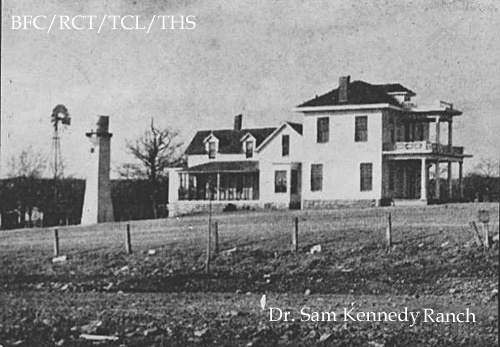 In the late 1920's, Dr. Kennedy proposed a new development called The Osage for the growing city. However, in 1930 the city voted not to connect streets or extend utility lines to this development. 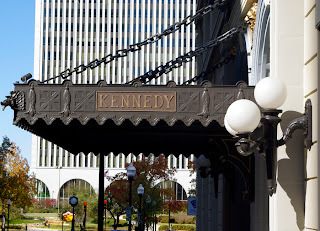 In lieu of the city's choice, Dr. Kennedy also made a choice which was to insert a clause into his will that none of his land, some 10 square miles directly northwest of the city, could be sold for 20 years after his death. He lived a long life, passing at age 77 in 1941. Therefore, Tulsa could not grow in that direction until 1961. As author Danney Gobel says in his book : "Many of Dr. Kennedy's good deeds were buried with him, but his spite was not interred with his bones." my comment is regarding some information I found on "A newspaper Reference Book-Men of Affairs & Representative Institutions of Oklahoma, 1916"
at this point; I have not found it listed in the LDS library or the Tulsa Gen. Soc online catalog. If you are interested in this list...I could scan and send it to you. 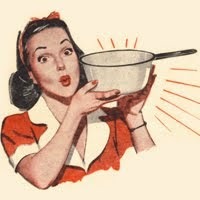 Hi Caron- thank you so much for your very kind offer. I did find the text of that book online here: http://tinyurl.com/27ys6f6 however it does not show any of the pictures. I would LOVE it if you could/would scan those pages with picture on them to me. My email is tulsahistory@aol.com Thanks! As a boy I used to climb one of the two 15' (?) brick columns that marked the entrance to The Tulsa Country Club and sit perched on the 3' diameter concrete ball that rested on top. I was very fond extremely and fixated on sitting up there. We lived at that time in the Osage Apartments. I've forgotten the name of the elementary school I attended near this spot. Not Pershing, although I went there too. This is one of a few websites I visit several times a week. I am rarely disappointed. Nice work Tulsa Gal! Hi Tulsa Gal! I enjoyed hearing you speak about your blog at the blog meet-up the other night- so here I am! LOVE your blog, look forward to reading more! Hi Lindsay- it was a fun meeting, wasn't it? Thanks for stopping by my blog! Anonymous the school your thinking about may have been called Lombard Elementry. That school doesn't exist any more. It was torn down. I have many fond memories too of this street growing up. As kids, we used to also sit on that 3' concrete ball. 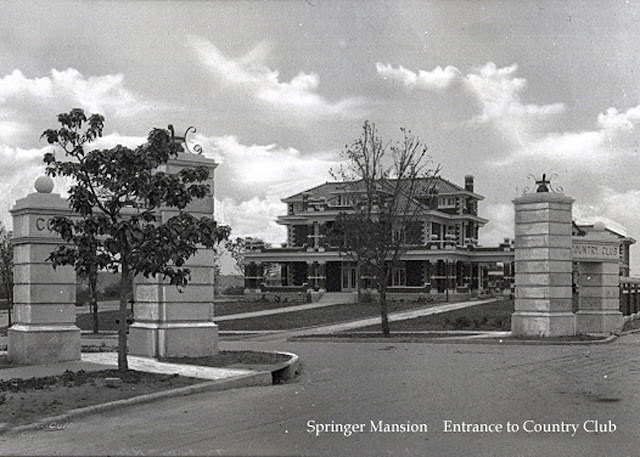 And as member's of the Tulsa Country club and "THE" kids of that street/neighborhood we used to play in the Kennedy and the Springer Mansion as part of our entire block growing up. 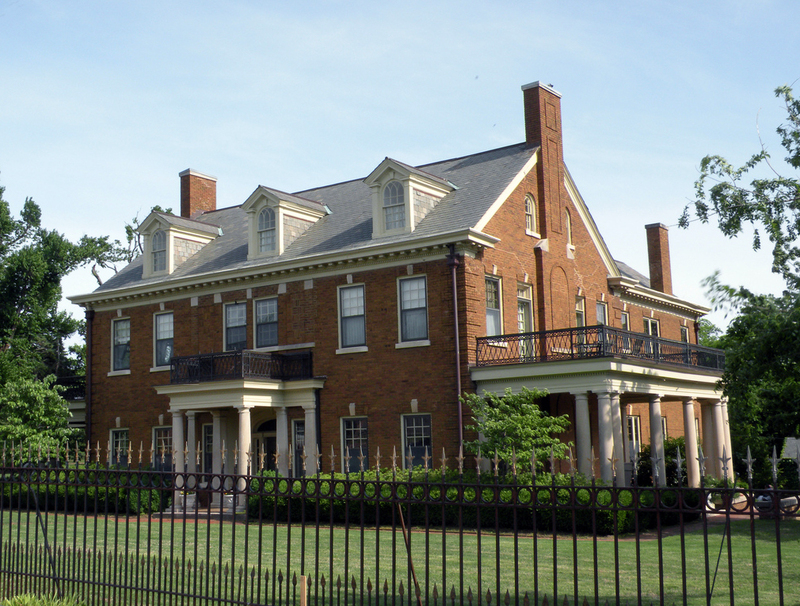 The Springer mansion for a time was used as the Sabo Gratto? A bingo hall. 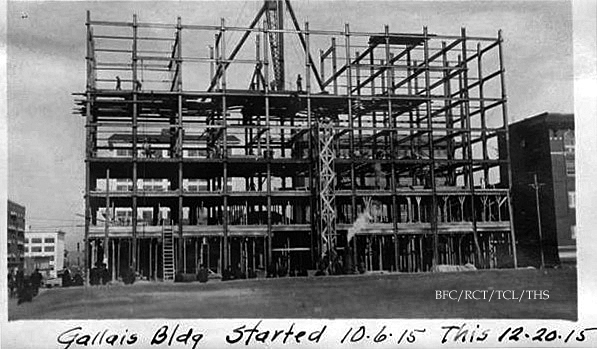 We kids sat and watched the Williams Center being built from atop the concrete ball on those huge Concrete Markers. We had a tree house built on the other side (south) of the Kennedy Mansion and we used the other field west and opposite/between our homes as our soft ball field. Many summer's playing football and "war" and being kids...sorta like the movie sandlot... but much better. Anonymous, you mentioned that the Springer Mansion was for a while the Saba Grotto. The Saba Grotto was the Shriner's Club House. Two friends and I were the caretakers for a while in the early 70's. Our job was to mow, clean up after the big parties and meetings and generally protect the place when no one was around. We lived in the Ambulance driver's apartment over the garage. I don't know how long they owned the mansion. I spent less than a year there with my friends and it must have been 72 or 73.